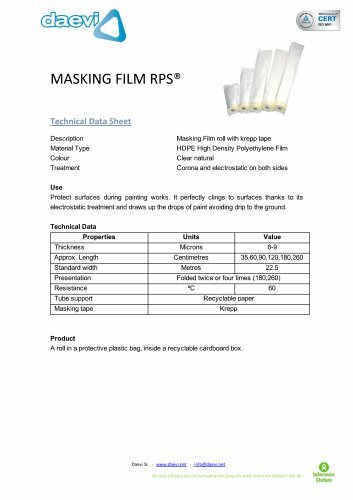 MASKING FILM RPS®Technical Data Sheet Description Material Type Colour Treatment Masking Film roll with krepp tape HDPE High Density Polyethylene Film Clear natural Corona and electrostatic on both sides Use Protect surfaces during painting works. It perfectly clings to surfaces thanks to its electrostatic treatment and draws up the drops of paint avoiding drip to the ground. Technical Data Product A roll in a protective plastic bag, inside a recyclable cardboard box. Daevi SL • www.daevi.net • info@daevi.net Do you collaborate on humanitarian projects with Intention Oxfam? We do.